Efforts to landmark the historic Los Angeles Times headquarters in Downtown Los Angeles took a step forward last week when the city’s Cultural Heritage Commission (CHC) agreed to take up a Historic Cultural Monument (HCM) nomination for the complex put forth by a group of Los Angeles preservationists. 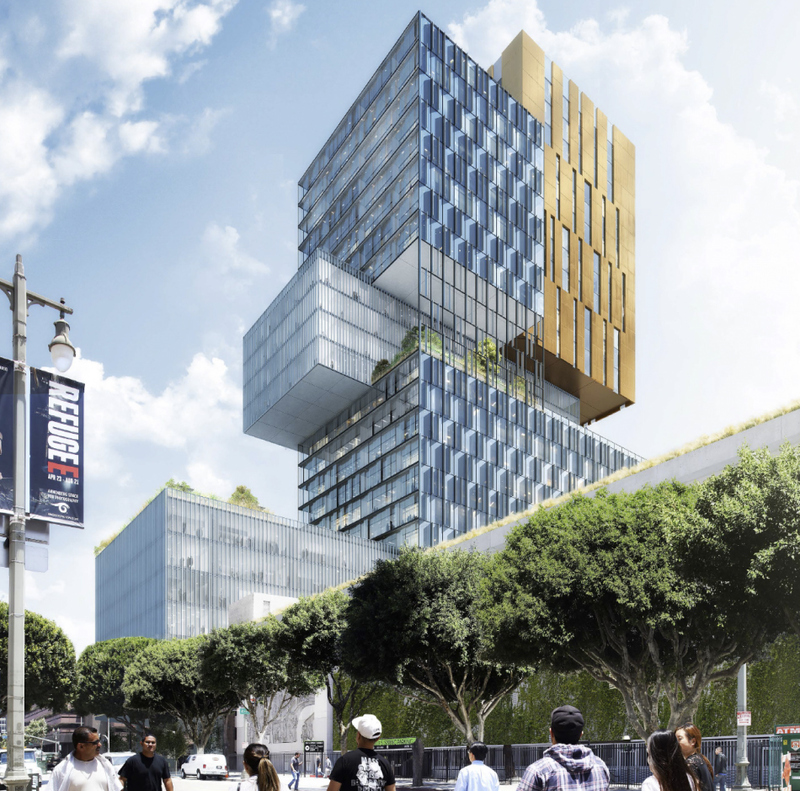 The agreement moves the historic nomination process forward for the five-building complex just as the Los Angeles Times staff vacates the property amid a move to El Segundo, California. 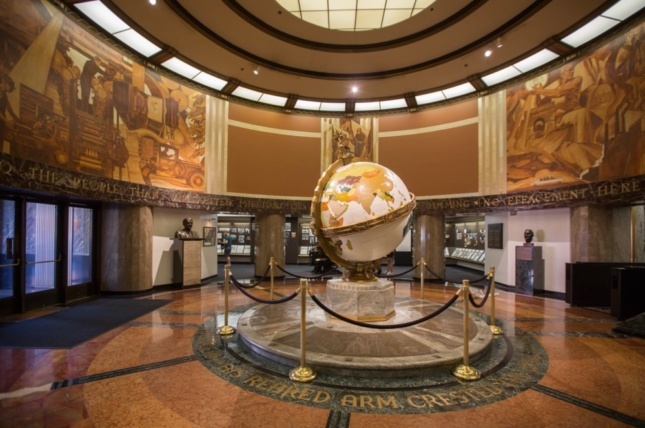 Concurrently, a fight over several of the buildings’ historic lobby artifacts has entered a new stage as the new LA Times owner, Dr. Patrick Soon-Shiong, has moved to illicitly remove a collection of historic elements from the complex in a bid to create an LA Times-focused museum at the paper’s new headquarters. The nomination for the complex was compiled by preservationist Richard Shave, also of Esotouric, with the help of other experts, including Cooper and the historian Alan Hess. The nomination considers the entire complex for designation, including a pair of late modern-era buildings designed by William Pereira. The eight-story Los Angeles Times Building designed in the Art Deco/Moderne style by Los Angeles architect Gordon B. Kaufmann in 1935. The four-story Plant Building completed in 1935 that includes an original two-story Art Deco/Moderne-style building by Kaufmann and two one-story additions designed by Los Angeles architect Rowland H. Crawford in 1946 and 1955. The six-story Times-Mirror Headquarters Building and an attendant six-story parking structure designed by Pereira in the Corporate International architectural style in 1973. The nearly 400-page historic nomination can be found here. The effort to landmark the complex—years in the making—is somewhat coincidental in terms of its timing with the newspaper vacating its historic offices and comes after a particularly turbulent half-decade at the Times. Soon-Shiong announced his purchase of the newspaper in February of this year and unveiled plans to move the LA Times offices in April. Canadian developer Onni purchased the Times complex in 2016 from the previous Times owner, Tronc, and had proposed raising the rent for the facilities to over $1 million per month, prompting the relocation. The Times’s lease ran out June 30, 2018. Onni is currently pursuing a pair of redevelopment proposals that aim to demolish the Pereria-designed sections of the complex. The developer plans to replace those buildings with two mixed-use condominium towers designed by AC Martin. 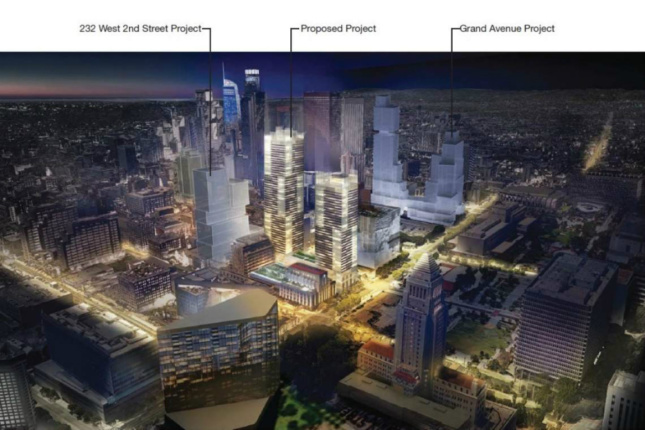 The towers, rising 37- and 53-stories, would bring 1,127 residential units and 34,572 square feet of commercial areas to the site. Gensler is also working on a blocky 32-story tower containing 107 condominium units, 534,000 square feet of commercial space, and 7,200 square feet of ground-floor commercial area that is slated to rise in what is now a parking lot across from the Times complex. 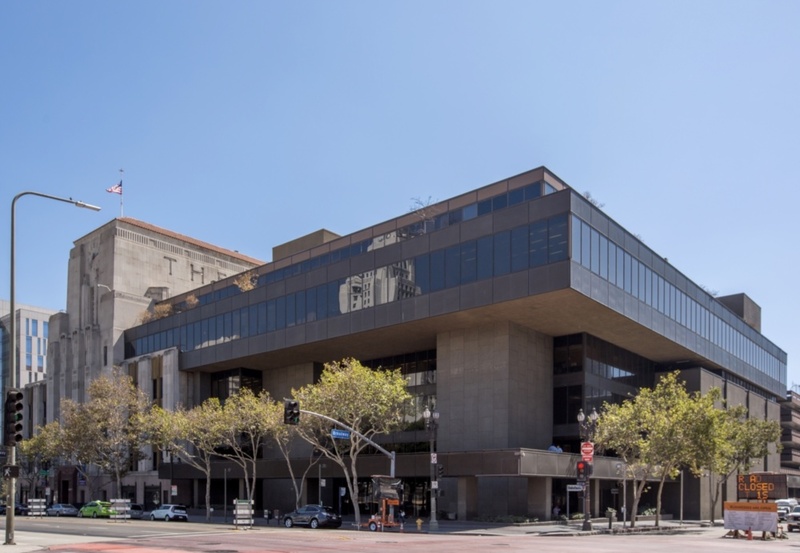 The CHC will next conduct an on-site inspection of the LA Times complex in order to consider whether to advance the application for historic cultural status any further. The designation could impact the developer’s plans for the AC Martin-designed towers, but as the recent case with Gehry Partners’s designs for 8150 Sunset complex shows, landmarking a historic structure does not prevent its demolition. If the HCM nomination is successful, however, the developer’s plans could actually be bolstered by the availability of historic tax credits for renovating the complex if that is done in line with historic standards. The entire complex is eligible for National Register of Historic Places and the California State Historic Monument list, though it is unlisted in both. The complex was included in the SurveyLA Los Angeles Historic Resources Survey and is listed in California Register of Historical Resources. The CHC will meet to tour the building at a yet-to-be-announced date and time. Until then, check out the nifty, illustrated explainer created by the Times that highlights the historic complex’s history and internal organization.